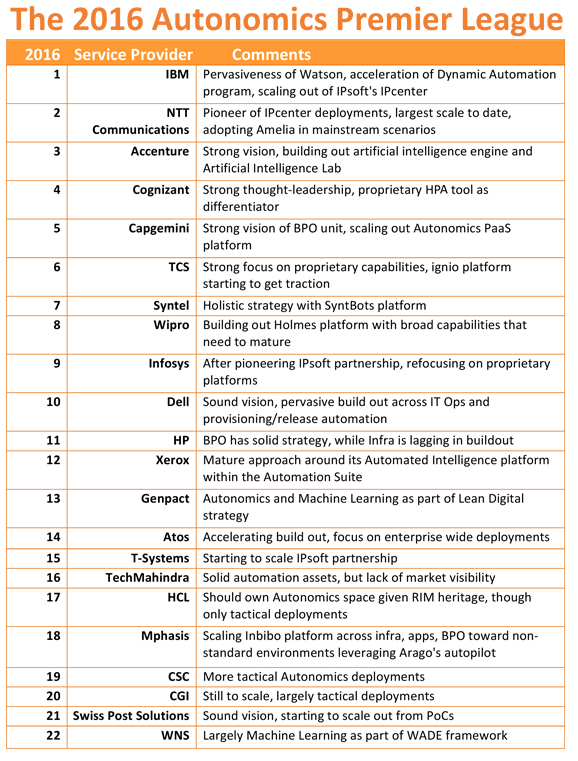 TOKYO, JAPAN - NTT Communications Corporation (NTT Com), a data, cloud and international communications leader within the NTT (NYSE: NTT) Group, announced today it has been ranked second out of 22 providers in HfS Research's inaugural Autonomics Premier Table 2016. "NTT Communications achieved a leading position in HfS Research's inaugural Autonomics Premier League Table for two reasons. First, for being a pioneer in deploying one of the leading process Autonomics platforms, IPsoft's IPcenter. Second, for scaling this platform out to represent the largest scale core Autonomics deployment around its Global Management One platform," commented Dr. Tom Reuner, Managing Director at HfS Research. "Furthermore, the company is helping to adapt IPsoft's Amelia cognitive platform to the Japanese language," he added.